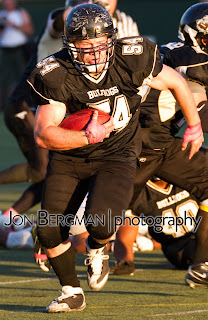 The Bellingham Bulldogs traded blows with the Grays Harbor Bearcats for four quarters Saturday, June 25 at Civic Field, landing the knockout punch late to seal the win. New Bulldogs quarterback Azubo Bearden broke the ice with the home crowd by connecting with wide receiver Toby Seim for a 50 yard touchdown in the opening minutes of the first quarter. The Bearcats did not flinch after falling behind 10-0 and countered with back-to-back touchdown drives. The team exchanged scoring drives through the first half ending in a 24 all tie. The second half carried the same tempo as the first as both teams continued to light up the scoreboard. In the fourth quarter the Bulldogs defense stiffened and held the Bearcats to a field goal deep in the red zone with less than three minutes remaining, tying the game at 34. A quick strike from Azubo Bearden to Toby Seim resulted in a 63 yard touchdown followed by an interception by defensive back Arthur Sanchez sealed the win for the Bulldogs. Final score: 41-34. Click here to view photos of the game.